This is a large park with plenty of activities for guests of all ages and thrill-tolerance levels. With its Dragon's Den bowl ride, the Black Hole and Warp 8 enclosed body slides ,and, especially, Double Geronimo (great name!) speed slides, Water Country has some thrilling ways to get wet. A more recent addition, Dr. Von Dark’s Tunnel of Terror, sends riders racing down an opaque (read: dark) drop and into a funnel ride with special effects. 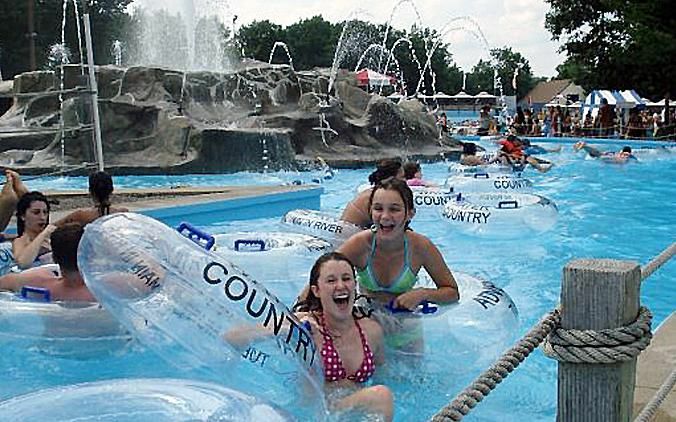 For the slightly less adventurous, Water Country offers the Double Dive Boggan mat racing slides, the Triple Giant body slides, and Shoot & Screamer tube slides. For the family raft rides, Thunder Falls and Wild Canyon, up to four riders can pile in large circular rafts and brave the rapids. The tube slides, Racing Rapids and The Plunge, are for single riders. For those who just want to chill out (or are too wimpy to tackle the more thrilling slides), Water Country has Adventure River, an 1/4-mile long lazy river. Other relatively low-stress attractions include the Giant Wave Pool, Whirlpool (which is not a spa, but a tube ride in a gentle vortex, and an activity pool. Younger kids will enjoy the Tahiti Tree House interactive water play center with small slides, sprayers, and a giant tipping bucket. Really young kids would want to head to Ollie Octopus and Pirate's Pool, two play areas designed especially for them. Portsmouth, New Hampshire. The address is 2300 Lafayette Road. From the Boston area and points north: I-95 towards New Hampshire. Exit 5 towards the Portsmouth Traffic Circle to U.S. Route 1S for approximately 3 miles. From Manchester, Concord, Nashua, and points west: U.S. Route 101 E towards the Seacoast. Merge onto I-95 N. Follow directions above. The park offers a number of stands that serve a variety of fare, including pizza, sandwiches, burgers, fried chicken, and the usual suspects as well as some non-traditional items such as turkey chili and clam chowder. There is also an ice cream stand with soft-serve and hand-scooped treats. Water Country does allow visitors to bring in their own food, but prohibits glass containers.